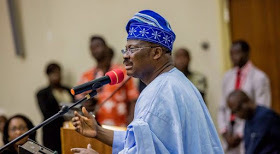 Governor Abiola Ajimobi of the state of Oyo has granted amnesty to 15 different offenders at various levels, serving various sentences in various state prisons. Oluşeun Abimbola, Attorney General and Attorney General, announced the disclosure in Ibadan on Tuesday. Mr. Abimbola said that 11 prisoners could either be released immediately or their sentences reduced, while four others would have their death sentences commuted to life imprisonment. "The Governor granted the amnesty in exercise of his authority under Section 212 of the 1999 Constitution.